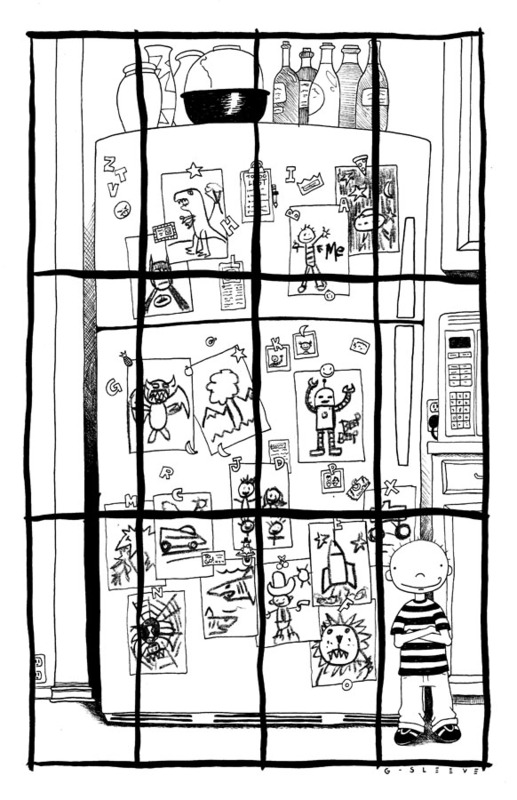 Home > G-sleeve Art > "Being a Kid" Prints by David > "The Artist"
"The Artist" print is one of nearly 100 vignettes in the "Being a Kid" series drawn from the boyhood experiences of the artist, David Gildersleeve. This print is based on "actual" events. Click image to enlarge. As a young artist, David was very much appreciated by his Mom. Every drawing he gave her, ended up in Mom’s “gallery” — prominently displayed for all to see on the refrigerator. Visitors were all guided into the kitchen to see his latest “masterpieces” on display. Whether this praise had anything to do with David pursuing a career in art or not, it sure made him proud to know his greatest fan was there supporting his efforts. Looking back, those early “masterpieces” may not have all been worthy of such prominence, but according to “Mom”, they were! All kids love to draw and Mom is their critic-of-choice. This illustration gives a budding artist some encouragement — the kid was a budding artist too, and because of his Mom’s praise, he happily pursued a career in art. This print (11" x 17") is foam-core backed and suitable for framing, and is perfect for hanging in a boy's room. All kids love to draw and this piece gives a budding artist some encouragement of another kid who has never been happier with his career choice. And perhaps you can also say – "I was once that boy!"